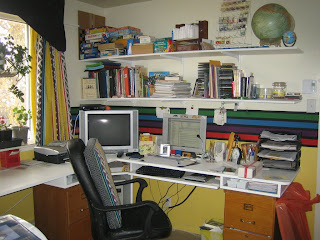 I've been busy busy busy with repairing walls, painting and building a new desk for the office! Things are finishing up nicely for the upstairs. 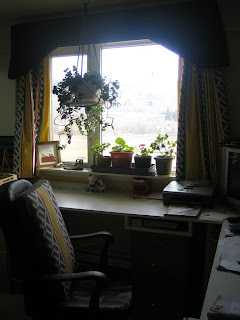 Here are some pictures to show off all my hard work. 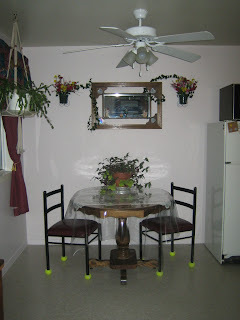 Here is the dining room table. There is only myself and my son so we don't need anything too big for daily needs. For big dinners I have folding chairs and a table in storage that gets set up for the big day. 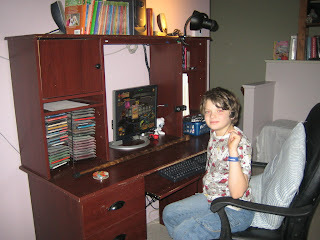 This is my son Robert using the old PGD desk in it's new home. The dining/school room. He's playing Wizard 101 a favourite online game. I actually play this one with him. Well now that I have shown off all my hard work. It's time I got on with other work. Namely supper and then the rest of the clean up. I hope you enjoyed seeing what I've been up to.